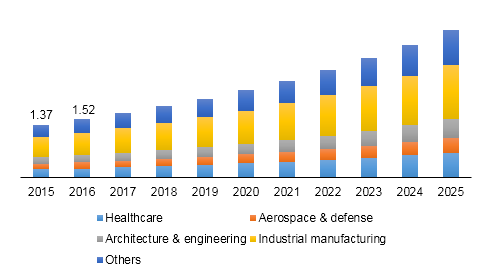 31 January 2019 - The global 3D scanner market size is projected to reach USD 3.8 billion by 2025. Increasing adoption in healthcare industry for making customized gloves and prosthetics is expected to drive the market over the projected period. Medical industry is one of the potential end-use markets generating demand for high-end portable/handheld scanners as they are preferred at medical specialties. Ability to obtain comprehensive information and geometry of vehicle parts is anticipated to escalate the usage of 3D scanners in the automotive industry. For instance, automotive industry adopted SMARTTECH 3D scanner to build a supercar. Production of prototypes to achieve precision and durability in sports car becomes easier with the help of these scanners. Accurate and textured 3D models of objects including motorcycle exhaust system and alloy wheel is expected to boost demand for structured light scanners over the forecast period. Taking precise measurements in sharp resolution and effective scanning increases their scope of application. Structured light scanners are ideal for capturing objects of various kinds including the ones with black and shiny surfaces. Fast and thorough indoor and outdoor three-dimensional measurement is expected to promote product demand. Moreover, growing scope of application in oil and gas industries for pipeline surveying is considered as one of the key growth drivers for the 3D scanner market. Constant technological developments to attain high efficiency and rising consumer awareness are expected to further drive the market. Adoption of strategies such as mergers and acquisitions and new product developments by manufacturers to ensure sustainability will create a favorable scenario for 3D scanners throughout the forecast period. For instance, in 2016, SHINING 3D, a Chinese 3D digitizing and printing enterprise, signed an agreement with KS DESIGN LAB from Japan to market its EinScan-Pro and EinScan-S 3D scanners. In addition, in April 2017, FARO Technologies, Inc. acquired Nutfield Technology, a laser scanner manufacturer to expand its geographical presence and product portfolio. Growing demand for smaller, portable, and plug and play solutions for high-resolution and accurate scans has created opportunities for companies to integrate and expand their product portfolio. For instance, in November 2017, Leica Geosystems, specializing in measurement technology, announced new ScanStation P50 3D scanner, which offers a scanning range capability of more than one-kilometer. In April 2018, Artec 3D, developer and manufacturer of 3D software and hardware, announced integration of handheld scanners with Geomagic freeform software to streamline workflow for manufacturing ready design. Manufacturers in 3D scanner market focus on product development to sustain the stern competition. Some of the key market players include Hexagon AB; CREAFORM; Artec 3D; FARO Technologies, Inc.; 3D Digital Corp.; Surphaser; Topcon Corporation, Maptek Softwares LLP; and ShapeGrabber, Inc.
Why Do You Need To Integrate 3D Scanning Technique In Your Business? If you own apparel business, then you know how complex it is to deal with customers. People are more cautious while buying their attires, but many times they fail to buy perfect apparel. It is easy to get styling advice from one of the designers, but while selecting apparels people tend to get confused. And if they are not fully satisfied with their attire, they tend to return it to the store. It is the most common dilemma that each customer and apparel business frequently faces. The major cause of apparel return is the unfitting size. Even if the customers know their perfect size, sometime they could get in to dress that they have purchased. This mainly happens in case of online shopping, since the customers are not able to try the outfit. For all these circumstances, there is an ultimate solution to opt for 3D body scanning technology solutions and devices. You can integrate devices and solutions like full body 3D scanner in your apparel store, be it online or physical. Such devices have inbuilt scanners and cameras to scan the whole body of the person and capture his/her exact size. By this, you can facilitate customers to try the apparels before purchasing them and know the precise size required to fit in that particular attire. Overall 3D scanning technology will be immensely beneficial to your business as well as your customers. You don’t have to face frequent returns by the customers. The best part you will have an increased number of customers for your store due to the unique technology that you have integrated. Moreover, customers will return to your stop frequently, thus you will have a great profit after integrating 3D scanning technology. But where you will get such innovative solutions? [TC]² is the ultimate place to obtain cutting-edge technology solutions and devices like 3D body scanner, full-color scanner, mobile scanners, computer-aided design software and so on. [TC]² is the top-most manufacturer of 3D body measurements, scanning and visualization devices. It has been effectively helping a range of business including fashion, fitness and medical, to embrace advanced technology solutions and improve their services. The devices and solutions offered by [TC]² are getting immense admiration worldwide. [TC]² will also aid you to enhance your services and thereby make your business super flourishing. Don’t wait anymore, discuss your requirements with [TC]² and get the perfect solution for your business. Most of the apparel manufacturing industries decide the measurement of garments according to the standard sizes of models. In a consumer perspective, finding the right size of clothes are often challenging. No matter how beautiful a dress is, inaccurate measurement would eventually disappoint consumers and make their investment go into vain. If you are running a firm who is looking for advanced 3D body scanner, then should consider the best manufacturer that helps you in overcoming the designing challenging through providing remarkable 3D body scanner. The 3D body scanner device is the latest innovation in the realm of technology that easily captures the shape of a body through non contact technology. This technology examines the correct size and shape of the body and develops 3D digital graphics within fraction of seconds. Not only the manufacturers but the consumers have also benefitted by allowing them to try on clothing on a virtual mode. Consumers have the accessibility for virtual applications which enable them to visualize how the clothes will fit on them before placing order to an online store. If you are searching for a trusted manufacturer that provides lightweight and powerful full body 3D scanner, then look no more and consider [TC]². It is the premium 3D body manufacturing firm that has been the serving the industries fitness, fashion and medical since years. [TC]² employ scanning, 3D body measurement and other visualization techniques which sets them apart from other technological industries. It was founded in the year 1979 that has changed the scenario of clothing measurement to a whole new level. It offers path breaking technology which allows them to monitor the body for obesity treatment and cosmetic treatment. Therefore, it is the one-stop platform for those who are seeking for high-end body scanner device. [TC]² is the prestigious 3D body manufacturing firm which provides 3D measurement scanner for human body. 08 January 2019, The global 3D Scanner Market size is projected to reach USD 3.8 billion by 2025. Increasing adoption in healthcare industry for making customized gloves and prosthetics is expected to drive the market over the projected period. Medical industry is one of the potential end-use markets generating demand for high-end portable/handheld scanners as they are preferred at medical specialties. How to Upgrade the Firmware for HP Printer? HP keeps updating the firmware of its printers regularly to provide the best to its users and keep them engaged in the brand. These updates for the firmware come up with minor or major bug fixes for the product as well as some product enhancements. You need to update your printer’s firmware depending on the printer model and do it at regular intervals to make sure you get the best results out of your printer. There are different ways using which you can update the firmware of your printer or you can simply contact the tech expert available at HP Printer Customer Care Number. Update directly from the printer: The HP printers released in 2010 and later support web services and cloud-based printing services that include ePrint, printer apps as well as printer updates using which you can directly print from the control panel. Such printers can use the internet connection to find and install the latest updates. This method is not available when the printer is connected to the computer with a USB cable. 1. Open the printer update feature available as per the model of your printer. 2. Next, follow the on-screen instructions to enable the Web services and set up automatic updates to set up the printer’s internet connection so it can start receiving updates. 3. If the update process is not started automatically then select Check for Updates to start the update. 1. Make sure the printer is on and connected to the computer through a local network or a USB cable. 2. Go to the HP Software or Driver download page and click on the ‘Printer’ option from the number of products given. 3. Enter your printer details and click ‘Submit’. 4. Click on ‘Firmware’ and then click ‘Download’ to save the file. 5. Click on the downloaded file to start the installation process. 6. When the HP printer update window opens, check if the serial number displays and click ‘Update’. 7. After completing the update click on ‘Ok’. For further support regarding HP firmware updates, you can dial the HP Customer Support Number.